Whither in Italy, Germany, Fraunce or England, muisic by gate o court an kirk wis floorishin aa ower Europe in the Renaissance an Baroque periods. But what o Scotland? Wis it aa juist bagpipes, reels an fowk sangs? I pat on my speirer’s bunnet an haed a bit leuk . . .
Atween c1430 an c1750 — a time at comprehends twa muisical eras scholars caas the Renaissance an Baroque periods — Europe’s kirks an royal courts wis the patrons o ‘airt’ (or ‘clessical’) muisic. Tak, for instance, the liturgical muisic o the Renaissance, like the Masses an motets o Italy’s Giovanni Pierluigi da Palestrina (c1525–94). 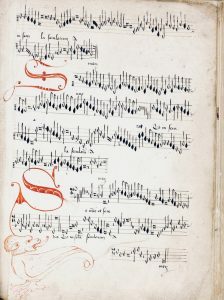 Or, efter in Germany, the fouthie ootpit o J. S. Bach (1685–1750), at’s kent as the heidmaist componer o the Baroque period. Siccan dargs couldna hae been wrocht withoot the siller o the estaiblishment. For maist o the time period we’r concernt wi Scotland wis yet a free-staundin kintra, an for aboot hauf o it haed a royal court steidit in Edinburgh. It gart me wunner (as a body at lang syne did a bit study o early European airt muisic) what wis gaun on in Scotland at yon time. The subject o liturgical or court muisic in oor airt o the warld haed niver kythed in the year I studied the muisic o the period, an — I maun admit — I’d niver thocht tae leuk intil it afore nou. The naitur o events at maks up Scotland’s history — the mixter-maxter o political, religious an social dree — haes meant the extant lave o muisical ongauns frae earlier times isna ower fouthie. The 14t century wis a time whan Scotland wis fechtin for its independence. Syne the Protestant Reformation hauf-gates throu the 16t century gied us a dour national kirk at haedna muckle time for sic joys as muisic. An o coorse in 1603 the union o the crouns gart the Scots court flit sooth tae Lunnon, takkin wi it cultural daeins an airtin. Aa this did nae favours tae the haudin gaun an development o Scots cultur, muisic includit. But what daes survive o, an what div we ken in general anent, early Scots airt muisic? In Scotland the earliest scrievit muisic at survives belangs the 13t century, durin a time muisic scholars caas the Medieval period. The Saunt Andras Muisic Beuk is a muckle cairn o kirk muisic manuscripts copied some time aroond 1230–50. It haes intil’t a guid feck o muisic frae Nostre Dame in Pairis, an a nummer o warks jaloused tae be by (unkent) Scots componers. As we’ll see, the wark o French componers wis tae influence the muisic o Scotland oot-throu the Renaissance. Atour frae the 13t century, the’r a hymn in the Laitin tae celebrate Princess Margaret’s waddin tae King Eric o Norrowa in 1281. It’s thocht tae hae been written by a Friar Maurice at steyed in Norrowa an at wis likely a Scot. But nocht mair nor at haes survived. A page frae the Inchcolm Antiphoner, c1340, ane o the earliest blads o Scots muisic we hae. Image credit: Edinburgh University (CC BY 3.0). Siclike, no muckle is kent aboot aither court or saucrit muisic in the 14t an 15t centuries. Doutless some liturgical blads wad hae been tint tae war wi England (the Border abbeys, for example, wis connacht an re-biggit in the coorse o the wars). Ae manuscript we div hae is the Inchcolm Antiphoner frae the 14t century, at comprises muisic o the Celtic kirk. A bittie efter, it’s kent that Jeames I (rang 1406–1437) invitit scholars frae England an Flanders tae gie wysins in the airts til his court. We ken, tae, that muisic played a central pairt in chaipel services in the newly-foondit universities o Saunt Andras, Glesca an Aiberdeen in the 15t century. But binna the antrin scart an a puckle scrieved-on sclates frae Paisley Abbey, the’r naething o the period at survives. Aa in aa, while no muckle is extant pre-16t century, we can jalouse there maun hae been some kind o national compositional tradition in Scotland at wad hae providit a foond for later componers tae big on. It wis in the late-15t an intae the 16t centuries that Scotland’s medieval Makars wis tae the fore in Scots cultural life. Poyets sic as Robert Henryson, William Dunbar an Gavin Douglas wrate the maist weel-regairdit verse at — aatho tae modren lugs no sae kenspeckle as the warks o Robert Burns — is still kent an in prent the day. Daes Scotland hae a muisicial ootpit at can staund proodly alangside the byordinar quairs o the Makars? Weel, happily we ken a bittie mair anent the muisic o Scotland in the 16t century nor we dae aboot earlier times. 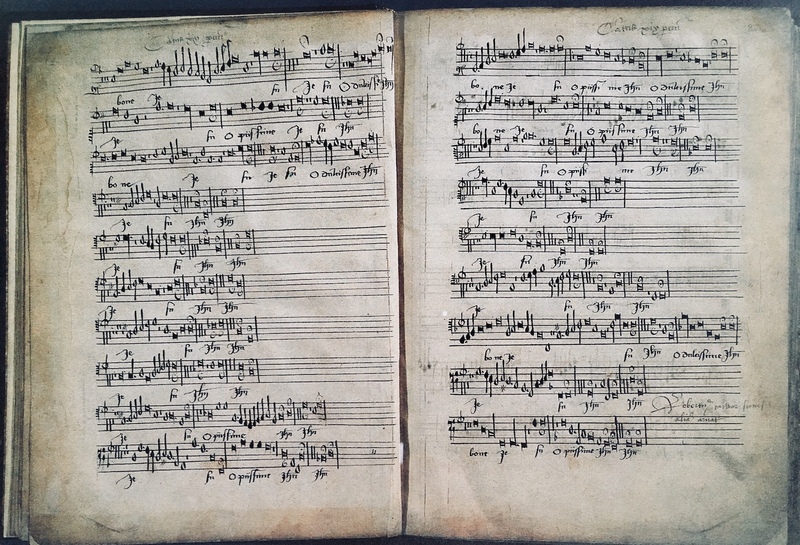 Maist namely amang componers o this period is Robert Carver (c1484–c1568). The Carver Choirbeuk, at comprehends his extant warks, is a byous pose o muisic at wis less or mair forgotten till fairly recent-like. A page frae the Carver Choirbeuk, a fouthie cairn o vocal polyphony by Robert Carver an ithers. Carver wis in the employ o the court o Jeames IV (rang 1488–1513), himsel a clarsach, keybuird an lute player. The ring o Jeames V (frae 1513 till 1542) wis siclike a sonsie time for Scots court muisic. His royal court mintit tae emulate that o Henry VIII an Leezabeth I in England, an a nummer o professional muisicians an componers wis keepit on haund. Like his faither, Jeames played the lute, an he wis a fine sicht-reader at the singin an aa. He on twa occasions mairit French princesses — the seicont bein Marie de Guise, mither o Mary, Queen o Scots — an at the time French cultur wis weel seen in Scotland. Componers sic as John Fethy wrate sangs at wis inspired by the French chanson an motet styles. 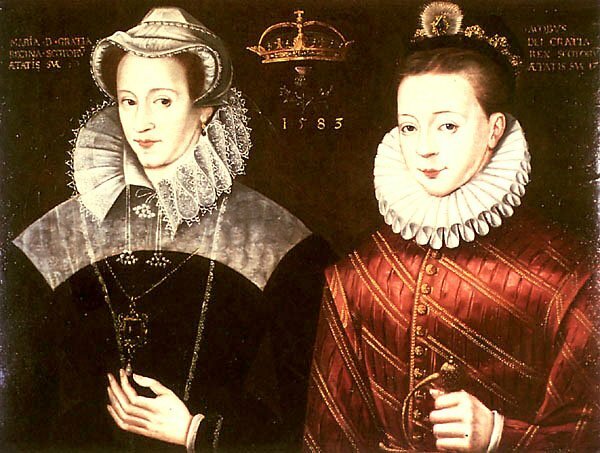 Queen Mary (rang 1542–1567) wis hersel a muisician, bein a player o the lute an virginals, an a bonnie sangster as weel. Mary wis born in Lithgae but spent the stairt o her ring in Fraunce, an didna retour tae Scotland till 1561, bringin wi her mair French muisical influence. Mary haed a nummer o muisicians in her employ, includin a group o ‘sangsteris’ an ‘violaris,’ an muisicians frae England an Italy wad frequent the court. A nummer o componers wis active durin Mary’s ring, includin Andro Blackhall, John Black, Andro Kemp an the forementiont John Fethy. A nummer o anonymous sangs haes survived, tae, an ye can lug intae them on Spotify. Mary’s muisical servitor wis Jeames Lauder (c1535–c1592), a componer o guid repute. The only extant wark we can say is his for shuir is the fine My Lord of Marche Paven (1584). He wis a freend o the poyet Alexander Montgomerie, an wad likely hae been a memmer (alang wi Montomerie) o Jeames VI’s ‘Castalian Band’ o poyets an muisicians. He micht weel hae been the componer o settins o a wheen Montgomerie poyems sic as In throu the windoes of myn ees. The Reformation cam til a heid in Scotland in 1560, an the reformt Kirk haedna the time for muisic they regairdit as ower fantoush. 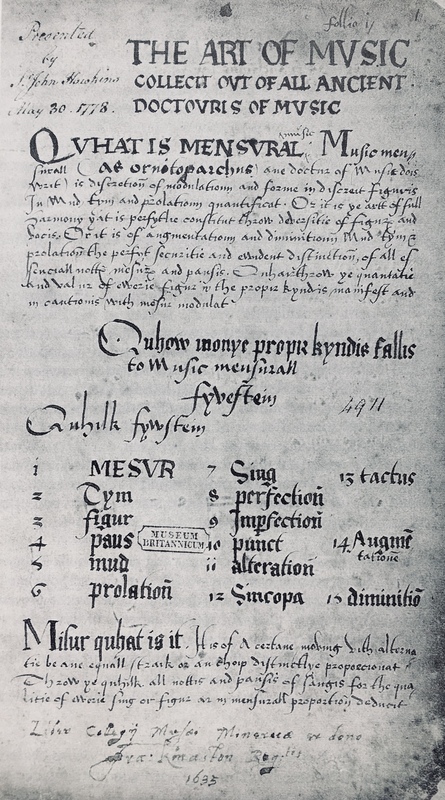 The style kenspeckle in contemporar Catholic worship is what’s caad in muisical terms ‘polyphonic’; that is, comprisin twa or mair independent (vyce) pairts (an kent at the time by the name o ‘musick fyne’). The reformers wis haein nane o it, derogatin the style as “prophaine” an “filthie.” Muisical instruments — maist o aa the kirk organ — wis thocht on as bein associate wi the Deil, an a stap wis pitten tae the prentin o secular muisic. An for tae win at their braider political ettles, the reformers set aboot wrackin Scotland’s muisical cultur an infrastructur, includin the connachin o kirk biggins an the manuscripts an prentit muisic they hoosed. This wis the selsame time that Palestrina in Italy wis componin byous warks at is unco weel-regairdit the day (sic as his maist weel-kent Mass Missa Papae Marcelli, thocht tae hae been written in 1562). Ane o the affcomes o aa the Reformation stour in Scotland is that the day we hae comparatively little in the wey o interestin muisic frae the time: juist a curn sangs, a wheen dances an a haundfu o instrumental warks. Aamaist the hale o the byordinar muisic librar o the Chaipel Royal (a important choral group steidit in Stirlin) is tint til us. The librar held fower antiphoners an mony ither cairns o manuscripts an prentit muisic. It’s a ferlie the Carver beuk haes survived. By aa accoonts the Reformation wis a disaster for Scots cultur. Houiver, it’s no like there wisna ony saucrit muisic efter John Knox an his reformers haed born the gree: the Kirk did mak uiss o Lutheran chorale melodies an psalm tuins frae Fraunce an England, an ye haed a nummer o componers — sic as Andro Kemp, David Peebles an John Angus — at teuk on the darg o settin thir melodies, alang wi new anes, in a semple, chordal wey, conform tae the contemporar European prattick. The ettle wis tae mak them easy for the kirk-fowk tae unnerstaund an sing alang til. The douce an mim arrangements, houiver, wis a warld awa frae the quirkie an airtfu polyphony o the pre-Reformation Kirk. 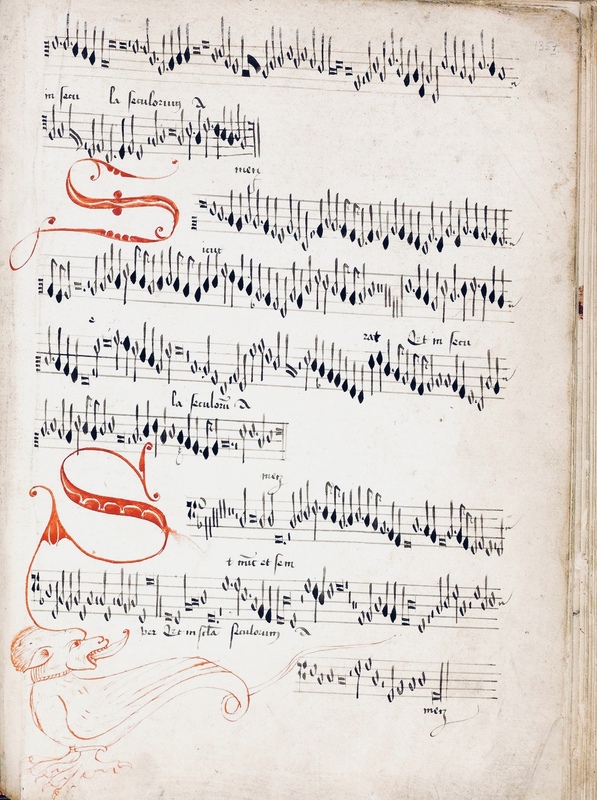 A page frae The Art of Music, Collecit Oot of all Ancient Doctours of Music (1580). The treatise wis ettelt at teachin students the airt o componin. Image taen frae Musick Fyne by D. James Ross. It follaes that in the dreich post-1560 environs there wisna the demand for skeely sangsters an polyphonic componers ony mair. Mony o the bigger Scots kirks haed lang haen ‘Sang Schules’ at learnt laddies skeels sic as organ-playin, pairt-singin an componin, an efter the Reformation the scuils suffert. 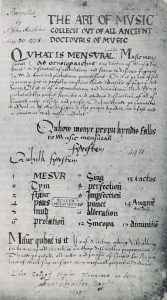 The dwynin o muisic makkin in thir post-Reformation years wisna a state o affairs at could be tholed for lang, tho, an Jeames VI (rang 1567–1625) declared in 1579: “[T]he art of musik and singing … is almaist decayit and sall schortly decay withoot tymous remeid be providit.” This royal decree ettelt at rebiggin the disjaskit sang scuils, an follaein its passin in Pairlament, the scuils, nou unner the owerance o the burghs, gaed on tae win back a guid bit tint grund. Ae wark we hae frae the time is The Art of Music, Collecit Oot of all Ancient Doctours of Music (1580). It’s a treatise at is mintit at teachin students the airt o componin. Ither warks at haes survived frae Jeames VI’s time include the ootpit o William Kinloch. Aa his extant warks is for the keybuird, an ye can check them oot on Spotify. Maugre Jeames VI’s ettles, houiver, the fundamentalist naitur o the Scots reformers yet limitit the scowth o componers. They warna able tae floorish as did their contemporars Thomas Tallis an William Byrd in England, aft-times findin themsels fouterin wi psalm tuins insteid o winnin forrit wi their airt. Ower a hunder psalms, hermonised by a sweirt David Peebles, is collectit in the Wode Pairtbeuks, at we’r chancy eneuch tae hae in oor possession the day. The pairtbeuks — pitten thegither by Tammas Wode, vicar o Saunt Andras — haes intil them warks by a nummer o componers, an includes motets an ither saucrit warks in the Hie Renaissance style. The tenor pairt o Psalm 150 frae the Wode Pairtbeuks. The pairtbeuks comprises 16t century muisic frae Scotland, England an continental Europe, includin 106 psalm settins an ither warks by David Peebles. Image credit: Edinburgh University. Jeames VI becam Jeames I o England in 1603 an the royal court flittit frae Edinburgh tae Lunnon, lea’in muisicians in Scotland in a swither as tae the wey forrit. While the loss o sic a important patron wis a stamagaster, the muisical tradition, as weel as a puckle sang scuils, did haud gaun for a while. At the Glesca sang scuil, for example, componer Duncan Burnett scrieved a nummer o warks for keybuird at’s extant the day. Aa in aa, tho, efter the loss o the court, hamelt composition in Scotland dwyned for the time bein. Ae muisician durin the Baroque period wi guid potential wis John Clerk o Penicuik (1676–1755). He spent time as a student o the weel-kent Italian violin player an componer Arcangelo Corelli (1653–1713), an produced a wheen warks early on in his career. 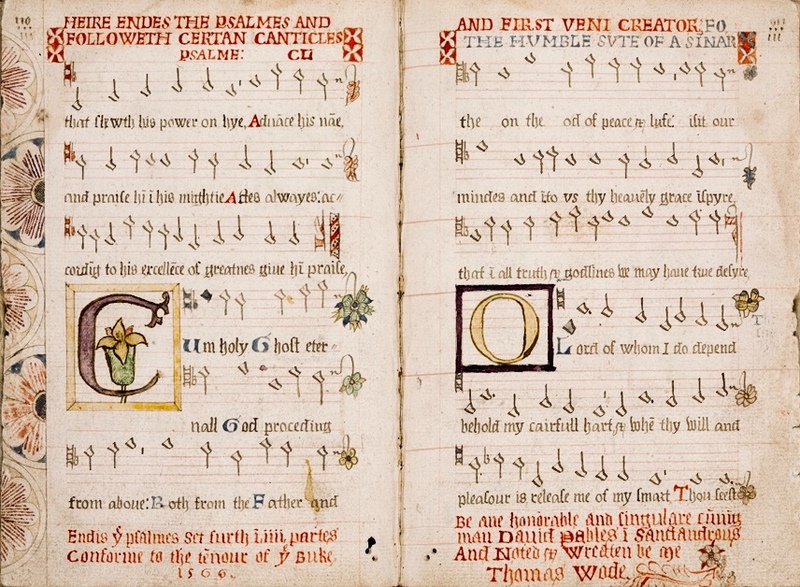 The scriever o Clerk’s entry in the Grove pits forrit the cantata Odo di mesto intorno as Clerk’s best. The first performance o it wis led by nane ither than Corelli himsel in 1698. At the hinder end, tho, Clerk’s potential as a componer wis tae be left unfulfilt, as he gaed intae politics in his mid-20s. An sae the day we hae a state o affairs whaur the airt muisic o Renaissance an Baroque Scotland haes been forgotten. In the een o the warld, Scots cultur haes come tae be thocht on as couthie, happit in tartan, the bellum o massed bagpipes drounin oot maist aa else. Juist as we maunna forget the warks o Makars like Dunbar an Douglas, sae we should tak braider tent o Scotland’s muisical history. As I’v learnt in the coorse o my speirins, the muisic produced here in the Renaissance an Baroque periods is gey aften gallus, furthie, an firmly steidit in the cosmopolitan European context. An frae it we can learn muckle aboot Scotland’s bygane, baith airtistic an political. Ay, it’s sad no a hale lot o it survived the Reformation, but what we div hae is weel wirth luggin intil. I’v pitten thegither a Spotify playlist o muisic by the Scots Renaissance an Baroque componers mentiont abuin. Listen here (Spotify accoont required). Baxter, Jamie Reid. Music, ecclesiastical. The Oxford Companion to Scottish History (Oxford University Press, 2001; online, 2007). Accessed Mey 2018. Baxter, Jamie Reid. Culture. The Oxford Companion to Scottish History (Oxford University Press, 2001; online, 2007). Accessed Mey 2018. Beveridge, John (1939). Two Scottish thirteenth century songs. Cross, Lucy E. (date unkent). The Flaming Fire: Music from the Elizabethan and Stuart Royal Courts (concert programme jottins). Elliott, K. (2001). Kinloch, William. Grove Music Online. Accessed Mey 2018. Elliott, K. (2001). Lauder, James. Grove Music Online. Accessed Mey 2018. Elliott, K. (2001). Peebles, David. Grove Music Online. Accessed Mey 2018. Johnson, D. (2001). McLean, Charles. Grove Music Online. Accessed Mey 2018. MacKillop, Rob. The Art Of Music. Munro, Gordon James (1999). Scottish Church Music and Musicians, 1500-1700. Accessed Mey 2018. Purser, John. 12 Mey 2017. Burning questions: The elusive life and scant surviving works of Scots composer Robert Carver. The National. Ross, D. James. Musick Fyne: Robert Carver and the Art of Music in Sixteenth Century Scotland (The Mercat Press Edinburgh, 1993). S-U MS C. 233. 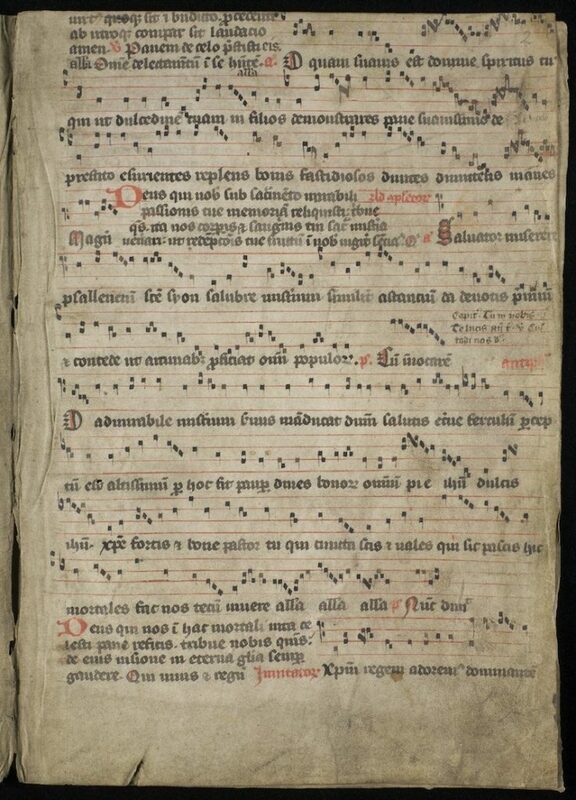 Digital Image Archive of Medieval Music, Uppsala, Swaden. School of Divinity, Edinburgh University. Singing the Reformation: The world of Reformation Britain as seen and heard in the Wode Psalter. Cheers for thon, Jamie. Musik Fyne, indeed! Glaid tae hae played a pairt in its revival. Mony thanks for aw your guid wark, Rob! Richt braw resairch, Jamie! A didnae ken ye were a muisicker! A’ll hae a wee ear-keek at yer muisic an aw! Muckle thanks tae ye, James!